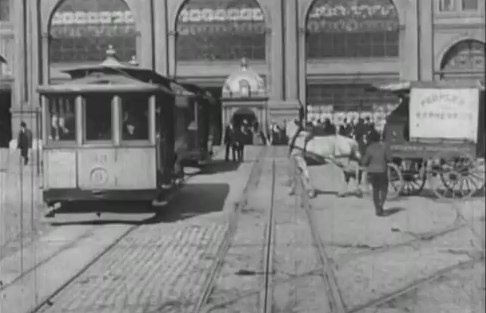 Sometime before the 1906 San Francisco earthquake, a camera was attached to a streetcar travelling north along Market Street, San Francisco, and recorded the hustle and bustle, the multi-modal transportation options, and the wonderful fashions of early 19th century San Francisco. The movie, which I happend to catch last week at SFMOMA as part of their great (but too large) Stein collection, is mesmerizing. Check it out here on You Tube. It is clearly pre-earthquake, but its exact timing has not been known until now. Ferry Building arrivalIn an article in Photogrammetric Engineering and Remote Sensing, Richard Greene narrows the window of aquisition down to between 24 March and 30 March 1906, just weeks before the earthquake on 18 April. Remember, that earthquake and the fires that followed largely destroyed much of the city. He performs this feat of timing through detailed photogrammetry: determing the time of day, the solar position, and the time of year from shadows on cornices and other architectural details. Greene, R., 2011. Dating the fliming of "A trip down Market Street". Photogrametric Engineering & Remote Sensing 77, 839-848. Check out some fun pics from the movie. In the new NYT artilce "Digital Maps Are Giving Scholars the Historical Lay of the Land," Patricia Cohen discusses the new academic field known as spatial humanities. Historians, literary theorists, archaeologists and others are using Geographic Information Systems to re-examine real and fictional places like the villages around Salem, Mass., at the time of the witch trials; the Dust Bowl region devastated during the Great Depression; and the Eastcheap taverns where Shakespeare’s Falstaff and Prince Hal caroused. BAAMA is pleased to announce The BAAMA Journal has been published in conjunction with Earth Day. Special thanks to all our contributing authors and editors. The BAAMA Journal is a publication that highlights Bay Area people and projects that use geospatial technologies. 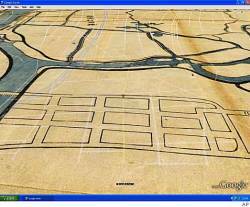 Mapping Ancient Civilization, in a Matter of Days using LiDAR! From Science News in the NYTimesNYTimes covers lidar! The husband-and-wife team of Arlen F. Chase and Diane Z. 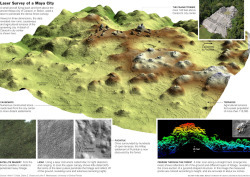 Chase used lidar sensors to penetrate the jungle cover to get 3-D images of the site of ancient Caracol, in Belize, one of the great cities of the Maya lowlands. See article. 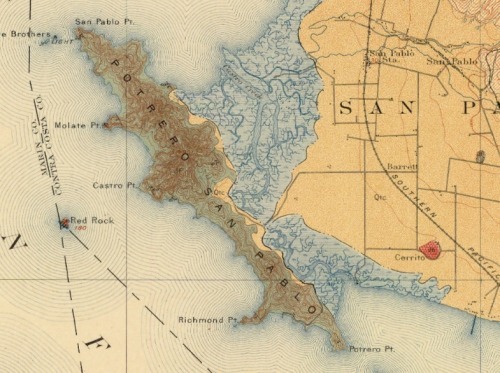 The San Francisco folio, including Tamalpais, San Francisco, Concord, San Mateo, and Haywards quadrangles, California is available as scanned pages (and maps) from the Texas A&M library project. This folio is part of the Geologic Atlas of the United States, a set of 227 folios published by the U.S. Geological Survey between 1894 and 1945. Each folio includes both topographic and geologic maps for each quad represented in that folio, as well as description of the basic and economic geology of the area. This is Folio 193, published in 1914. This edition has the charming and berkeley-relevant reference: "Geology by Andrew C. Lawson, assisted at various times by students of the University of California." You go Bears. This is the bay bridge plan... 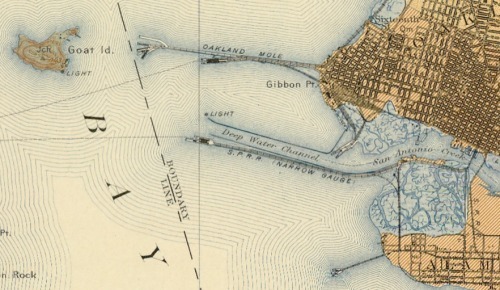 Goat Island is Treasure Is., there was a narrow gauge railway from Oakland for shipments to SF and beyond.﻿The repository interface with integrated Yahoo! Maps was developed by the Digital Initiatives -- Research & Technology group within the TAMU Libraries using the Manakin interface framework on top of the DSpace digital repository software. Geologic Atlas of the United States by Texas A & M University Libraries is licensed under a Creative Commons Attribution 3.0 United States License. 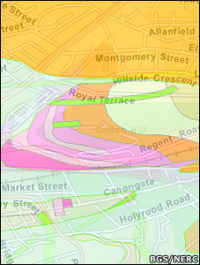 Now, as the BBC reports, the British Geological Survey's (BGS) has released their new OpenGeoscience portal, which allows the public to study all the UK's geology via a variety of webGIS formats (e.g. Google, and ArcServer). There is a viewer for bedrock geology and the overlying superficial deposits, and another for more geological layers — artificial ground, faults, mass movements, etc. 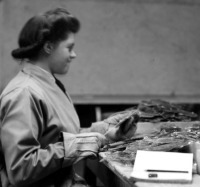 Worker at Pitlochry depot, Perthshire, processing Scottish mica.In a companion effort, the BGS is also releasing images from their historic image archive: 50,000 images are searchable and usable for non-commercial purposes. These images include lovely photography of some of Britain's icons of geology, but also includes image from 100 years ago of miners, explorers, and early 20th century industry. From the SF Chron: When Google Earth added historical maps of Japan to its online collection last year, the search giant didn't expect a backlash. The finely detailed woodblock prints have been around for centuries, but they show the locations of former low-caste communities. The maps dat e back to the country's feudal era, when shoguns ruled and a strict caste system was in place. Some surveys have shown that such neighborhoods have lower property values than surrounding areas, and residents have been the target of racial taunts and graffiti. But the modern locations of the old villages are largely unknown to the general public, until these maps were overlain on current street maps. I've been a sucker for these stories of people re-building sailing and exploring craft based on 1,000-year old plans ever since my parents gave me Kon-Tiki to read as an impressionable youth. Maybe it is why I love such riduculous Hollywood tripe like the 13th Warrior. 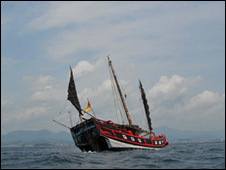 Now comes this news item: A replica 16th Century junk has sunk off Taiwan, one day short of completing an epic voyage to the US and back (see article). One day short of finishing! And you know why? They were, in BBC lingo, "rammed in two" by a freighter (there is a photograph). The 54ft-long (16.5m) Princess Taiping, powered only by cotton sails on three masts, was designed according to ancient specifications. Like the original Kon-Tiki, the raft used by Norwegian explorer and writer Thor Heyerdahl in his 1947 expedition across the Pacific Ocean from South America to the Polynesian islands. (Amazingly, there is a you tube video). Both expeditions set out to prove that folks other than the usual suspects could have made it here and back earlier than we thought. There was another, similar, high-profile event with the building and sailing of the "Sea Stallion" Viking ship, which made the journey from Denmark to Ireland in 2007, fully blogged. The entries started with hopeful titles like "Building a Viking warship" and "the ship is launched", and quickly turned shorter and grimmer, with "a rough first night" and "hypothermia strikes" and "hampered by the weather" and "false hope"... suggesting 1) that Vikings were, perhaps not surprisingly, very hardy, and 2) reasons why they didn't have time to leave detailed on-voyage journals. Still, I guess this stuff appeals to the same part of me that loves old maps, and that is the purported link to the blog. Eric Sanderson is visiting CNR next week: Chris G pointed me to his work. Imagining Manhattan before European contact through visualization. Gorgeous work, and appealing on many levels for geographers everywhere. Project site, and highlights from the New Yorker. The image here shows an aerial view of Manhattan as it might have looked in 1609, juxtaposed with the outline of Manhattan today. Check this out: a site that has historical maps of US counties. It's really cool stepping through time and seeing how the county borders shift and change. Dead simple site, great data. It's a little more interesting for the older states, like Massachusetts, but California has some interesting changes too. 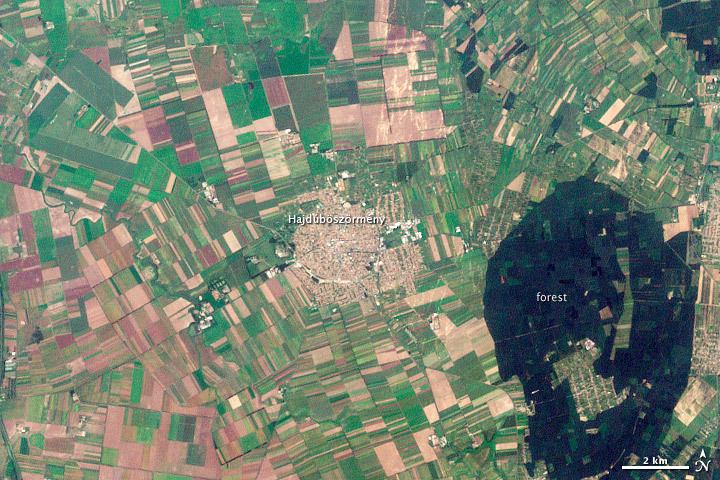 Via The Map Room: Historical Aerials from historicaerials.com. This is a great site. 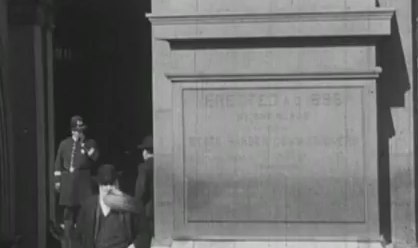 Look what I found for the campus in 1946. Where's our earthquake trap called Mulford? 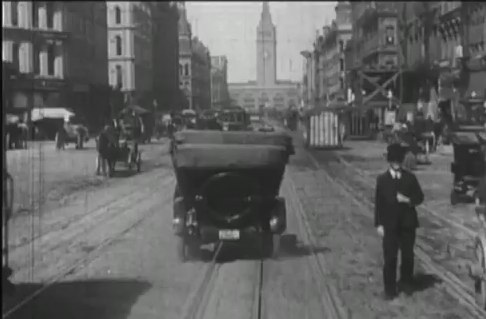 Obvi this is just a screenshot, haven't got the imagery yet, but the interface is good, and the bay area has tons of old imagery (interested yet, Tim?). I am reinvigorating the mission to re-shoot the VTM photos. At least in the Bay Area. This was prompted by the recent Berkleyan article about the new UC reserve in Santa Clara County ("preserves oak-woodland ecosystem at urban/wildland interface"). I thought "I wonder if there are any pictures of the area from the VTM collection?" and had a search this weekend. Sure enough, there are some nice ones. So I've geo-located a few from around the bay to get us started. Any ideas on: automating the process; making an easy site to upload paired photos; an easy way to link Township/Range queries into gmaps... Any volunteers to do Santa Cruz County? Lots of great pics there. And check out the local logging history documented in the photos of the New Almaden quad. Since I have been watching "Rome" the mini-series, this seems appropriate. See Trade Routes Through History.